Staples is planning to shutter 30 stores in the U.S. Staples Inc. announced on Tuesday that it's closing 30 U.S. stores and reducing its retail square footage in North America by 15% as part of a strategy to "accelerate growth." Staples spokesman Kirk Saville would not comment as to whether any job reductions are in the works when the company lowers its store count by a net total of 30. Staples' (SPLS) stock price fell 3% at midday. Scott Tilgham, analyst for Caris & Co., said it was likely that "if stores here or internationally are being closed, then positions are being eliminated." But he said the company might also rely on the natural attrition of retail workers. Staples, an office supply chain that sells computers as well as printers and copy machines, is based in Framingham, Mass., and will have 1,871 stores in the United States and Canada after the 30 are closed. Tilgham said Staples might be able to achieve the 15% square footage reduction by shifting from large stores to small stores, rather than closing a number of stores outright. "It doesn't really change the staffing too much, it doesn't really change the store offering too much, but it considerably reduces overhead," he said, noting that less inventory space is needed as the size of computers and other office machines have shrunk over the years. 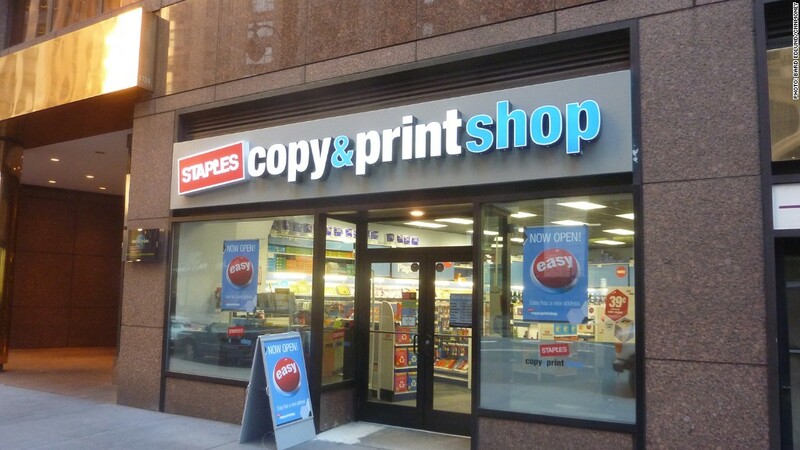 Related: Could Staples go private? Staples, which has a presence in 26 countries, also said it plans to shutter 45 stores in Europe by the end of the year, according to an internal letter obtained by Fortune's Dan Primack. The letter said the company was "accelerating" its closure of 15 U.S. stores, as part of the overall 30-store net reduction. A Fortune report on Sept. 13 found that several private equity firms are considering a buyout offer for Staples. The potential buyers include Bain Capital, a private equity firm that helped to launch Staples 26 years ago and was once led by Republican presidential candidate and former Massachusetts governor Mitt Romney.